All His Dreams for Wealth and Power Came True. As a young man in his twenties with an insatiable thirst for money and power, Jorge Valdés worked his way up inside Colombia's powerful Medellin drug cartel. His key position as head of U.S. operations brought him into direct contact with presidents, generals, Hollywood celebrities, hired killers, and kidnappers. This Cuban immigrant, raised in poverty, was living the high life in more ways than one. Then an incredible thing happened: Jorge Valdés encountered a person much more powerful than the strongest drug lord, someone who offered something more satisfying than women, drugs, money, prestige, or power. 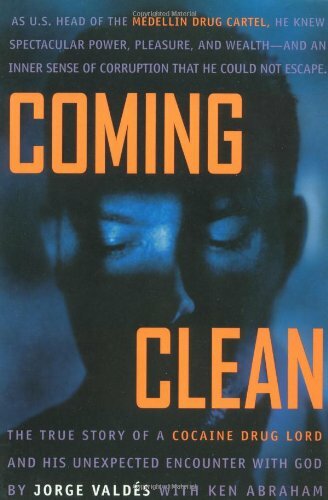 Coming Clean: The True Story of a Cocaine Drug Lord and His Unexpected Encounter with God offers an insider's view of the drug industry and the greed that drives it. More important, it weaves a compelling story of forgiveness, renewal, and hope. Is God really in the business of transforming cocaine drug lords like Jorge Valdes? Can we honestly believe Jorge's story of redemption? How often we hear the testimony, "If God can save me, he can save anybody." Yes, He can - and does. I am happy to say that after 33 years of law enforcement, I have finally found the one individual who truly changed. Jorge is a genuine article. Jorge Valdes is an extraordinary individual. His life provides an inspiring example of the transformative power of God's love. Coming clean about his past was a risky business and could have cost Jorge his life, but God had other plans. This is a remarkable story of triumph and rebirth.